As can be seen from the diagram below, the needs that Manisha UK aim to address span the full range of needs identified by Maslow in his famous Hierarchy Of Needs theory. 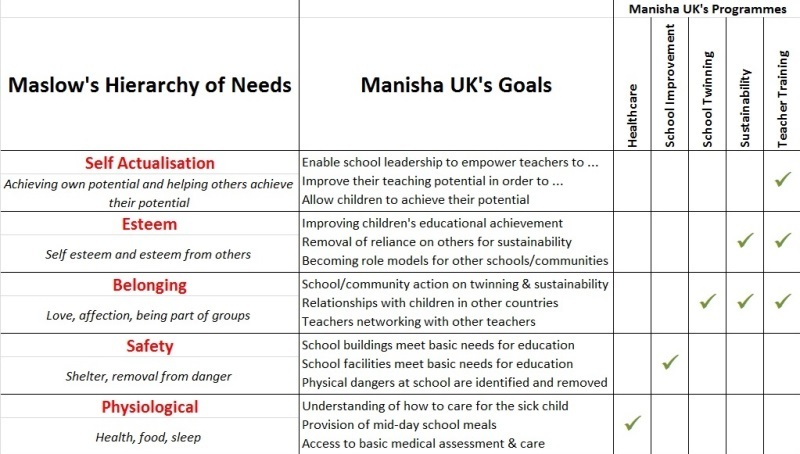 Manisha UK is focussed on implementing 5 programmes of activity, each with specified goals that will deliver measurable progress towards meeting the needs of the children, schools and communities that we support. Expressed in this way it is easy to see how the programmes and goals are integrated to form a complete and sustainable improvement in the communities that we support. Put simply, there is no point in improving the teaching potential of teachers if the children are unable to concentrate due to hunger caused by lack of a mid-day meal!